Rotana currently manages an expanding portfolio of over 100 properties throughout the Middle East, Africa and Turkey. 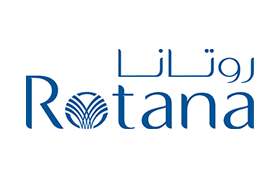 Rotana aims to make all time spent in their range of hotels ‘Treasured Time’, through the pledge to understand and meet the individual needs of all guests. In so doing, Rotana has evolved its product brands to include, Rotana Hotels & Resorts, Centro Hotels by Rotana, Rayhaan Hotels & Resorts by Rotana, Arjaan Hotel Apartments by Rotana and The Residences by Rotana. Earn Miles on stays at any of 60 Rotana properties in 22 cities, some located in the most exotic destinations, offering the best in Arab hospitality. Please quote your membership number when booking and present your Emirates Skywards card on check-in and/or at the point of purchase. Find a hotelOpens an external website in a new tab. * Eligible stay is any stay that has been booked at a published rate except for tour operator rates, free/complimentary stays and travel industry rates. The booking must be under the name of the Skywards member in order to qualify for Miles credit and room charges must be on the member’s personal account. Member may earn Miles for up to a maximum number of three rooms per stay. Rotana properties exempt from earning Skywards Miles are: Rihab Rotana (Dubai), Queen Centre Arjaan (Damascus) and Burgu Arjaan (Istanbul).